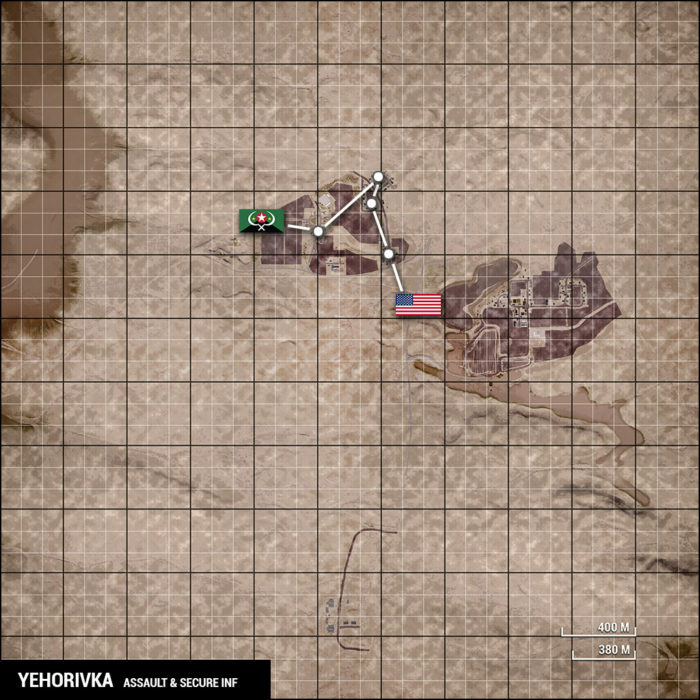 Version 7 Preview : Squad – Communicate. Coordinate. Conquer. We’re almost there! Alpha V7 is just on the horizon and it’s time for us to do an overview of all the major changes and features coming in the next patch. As the majority of the team has been singularly tasked with V7 Development over the month of July, this post will replace this month’s Recap for your monthly dose of Squad development updates. Squad kicks it into gear with the introduction of vehicle warfare, Squad drives further towards the combined arms warfare meta the game has been built for from the ground up. Truck transported troops dismounting in throngs pushing a flank; APCs giving heavy fire support for mechanized infantry assaults; counter armor ambushes; teams running logistics and resupply lines to support FOBs at the front, as well as a revamped forward operating base system, will enter the game soon. 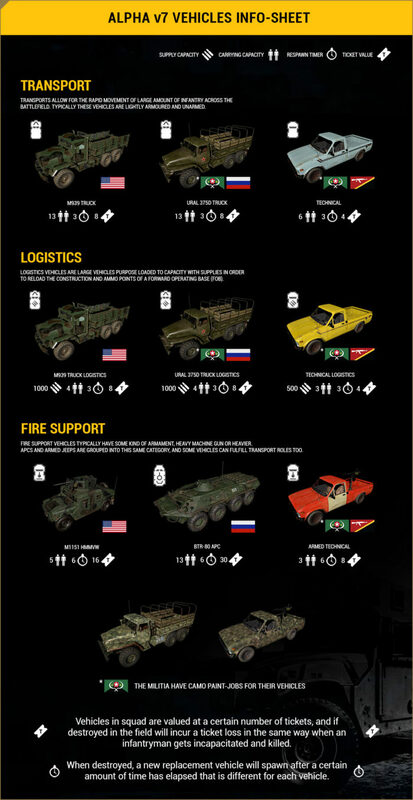 Coming in the next version each faction will be receiving a compliment of vehicles divided into 3 categories: Transport, Logistics and Fire Support. 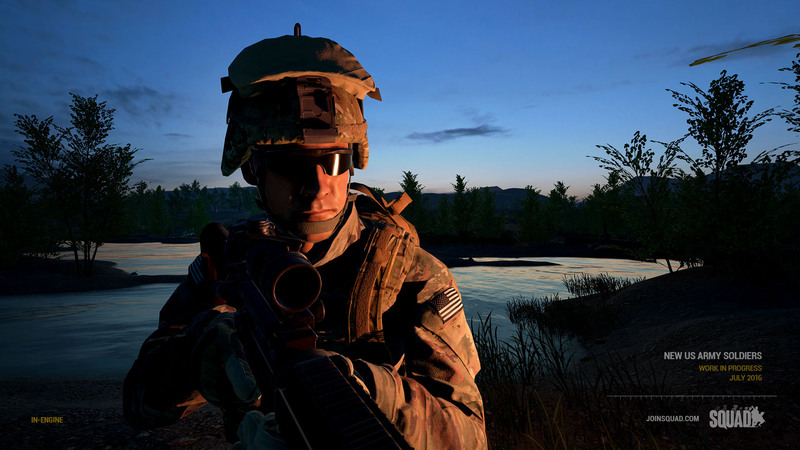 No matter how fast or accurate you draw and fire your weapon, Squad provides a multitude of gameplay roles, from medic to spawn point firebase defense, and now the introduction of logistics and resupply to Forward Bases adds another way for players to get in the action while not physically holding the point. On the flip side, crafty saboteurs can now infiltrate and ambush enemy supply lines. To maintain a level of order and to prevent teams devolving into a massive free-for-all, we are implementing a reserve vehicle system to open full vehicle control to pro-active Squad Leaders with coherent squads. As the first part of our new UI make-over, the Radial Menu has undergone a significant upgrade. The Orders and Enemy Spotting functions have been integrated into the radial menu, where markers can be placed in 3D World space simply by looking at and pressing the corresponding button on the radial menu. Submachine gun, SKS rifle and G3 family of rifles. 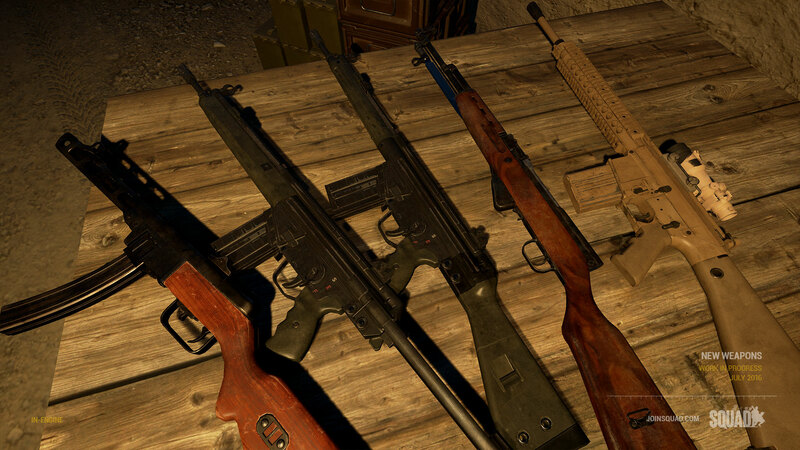 These weapons will be added to the existing lineup available to the Insurgents, giving players more varied means of dealing damage to the enemy. The SKS will also be featured for the Militia. The RPG-7 will now also be deployed with the ubiquitous PG-7VL HEAT rocket, capable of dealing with most vehicle threats on the battlefield. The existing Fragmentation rocket will still be in use, but users will now have to choose between one or the other depending on the intended target as both excel at dealing with either armoured (HEAT) or infantry-based (Fragmentation) threats. Previously shown off many months ago, the RKG-3 Anti-Tank grenade will be making its debut on the battlefield. It is a thrown grenade capable dealing with armoured targets same as a HEAT rocket, but the only caveat is that you need to be extremely close to your target to make the throw. Happy hunting! Finally a new deployable Heavy Machine Gun will be debuting in Alpha Version 7! The DShK-M is an old Soviet era machine gun that fires the massive 12.7x108mm round, capable of obliterating infantry and light vehicles. It will be mounted both on a tripod and also on the back of armed Technicals for both the Insurgents and Militia, giving gunners a full 360 degree arc of fire. Gunners need to be even more aware as they can also quite vulnerable to enemy fire. 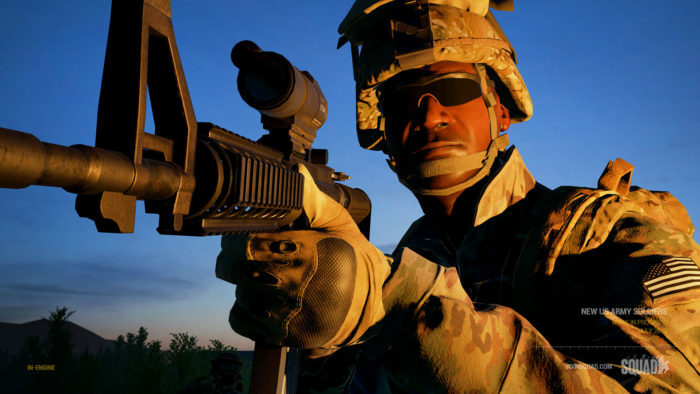 Our brand new US Army Soldier models are ready to rock and roll! 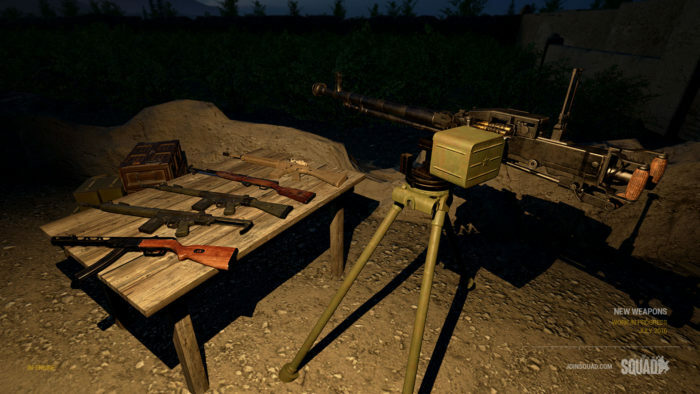 These will completely replace the older generation soldier models we have been using since the beginning of the game. While they have served us well over the course of development, it is time to put out the old and bring in the new hotness! Storming into Squad is our new map, Yehorovika. Designed from the ground-up to be a vehicle-orientated map, it is making its debut along with vehicles so prepare yourselves for some high-speed mechanised infantry combat on a level never-before-seen in Squad. You will now find even more variety among the maps in SQUAD. There have been new layers added including Gorodok Dusk and Chora Night. As well, with the addition of vehicles, each map will have an infantry only version available for those who enjoy the pacing and gameplay of infantry combat. Squad has been made compatible with the newest version of the Unreal Engine, and along with this comes a whole host of optimisations and improvements including dynamic foliage density and adaptive property replication. Both of these alone allow us to make a lot of savings on the client and server end when it comes to performance. Combined with many engine-level bug-fixes, 4.12 allows us to take that one step closer to having a smoothly running game for all coming into the new patch. Making a quick trip to the Modding sphere, a couple of very awesome projects are taking shape including a full Al Basrah remake and a Pacific islands-inspired map. Keep an eye out for their next update via the Modding Subforums, as well as on Discord. What you’ve seen here is just the tip of the iceberg. On release day we will be releasing much more detailed patch notes and a full changelog, so please look forward to that in the near future!